رفیعی, حمیدرضا, شیروانی, مهران. (1395). جذب سرب از محلول‌های آبی به‌وسیله سپیولیت و بنتونیت اصلاح‌شده با بیوپلیمر کیتوزان: همدما و سینتیک. مجله آب و فاضلاب, 27(3), 75-87. حمیدرضا رفیعی; مهران شیروانی. "جذب سرب از محلول‌های آبی به‌وسیله سپیولیت و بنتونیت اصلاح‌شده با بیوپلیمر کیتوزان: همدما و سینتیک". مجله آب و فاضلاب, 27, 3, 1395, 75-87. رفیعی, حمیدرضا, شیروانی, مهران. (1395). 'جذب سرب از محلول‌های آبی به‌وسیله سپیولیت و بنتونیت اصلاح‌شده با بیوپلیمر کیتوزان: همدما و سینتیک', مجله آب و فاضلاب, 27(3), pp. 75-87. رفیعی, حمیدرضا, شیروانی, مهران. جذب سرب از محلول‌های آبی به‌وسیله سپیولیت و بنتونیت اصلاح‌شده با بیوپلیمر کیتوزان: همدما و سینتیک. مجله آب و فاضلاب, 1395; 27(3): 75-87. در این پژوهش، کانی‌های رس سپیولیت و بنتونیت با بیوپلیمر کیتوزان اصلاح شد و ویژگی‌های جذبی آنها برای جذب سرب، در حالت بسته تحت شرایط مختلف، مانند زمان تماس و غلظت اولیه سرب مورد بررسی قرار گرفت. جاذب‌ها با استفاده از روش‌های XRD، XRF، FTIR، SEM و TOC مشخصه‌یابی شد و همدماها و سینتیک جذب سرب توسط این جاذب‌ها بررسی شد. مدل‌های همدمای لانگمیر و فروندلیچ برای توصیف داده‌های تعادلی به‌کار برده شد و ثابت‌های همدماها نیز تعیین شد. مدل فروندلیچ به‌خوبی داده‌های آزمایش جذب سرب به‌وسیله جاذب‌ها را توصیف نمود. پس از اصلاح رس‌ها با کیتوزان، ظرفیت جذب سرب به‌وسیله سپیولیت از 83 به27 میلی‌گرم بر گرم و بنتونیت از 56 به 29 میلی‌گرم بر گرم کاهش یافت. نتایج آزمایش‌های سینتیک نشان داد که رس‌های طبیعی به بیش از 24 ساعت برای به تعادل رسیدن جذب سرب نیاز دارند، درحالی که این زمان در مورد کیتوزان- سپیولیت به 16 ساعت و برای کیتوزان- بنتونیت به 4 ساعت کاهش یافت. مدل‌های سینتیک شبه مرتبه اول، شبه مرتبه دوم، الوویچ و پخشیدگی درون ذره‌ای برای توصیف داده‌های آزمایش به‌کار برده شد. مدل شبه مرتبه دوم، برازش بهتری بر داده‌های جذب سرب به‌وسیله سپیولیت، کیتوزان- سپیولیت و کیتوزان- بنتونیت نشان داد که دلالت بر این دارد که جذب شیمیایی مرحله کنترل‌کننده سرعت جذب سرب است. داده‌های جذب سرب به‌وسیله بنتونیت بهترین برازش را با مدل الوویچ نشان داد. In this study, sepiolite and bentonite clay minerals were modified with a natural chitosan biopolymer and the modified-clays were characterized using XRF, XRD, FTIR, SEM, and TOC analyses. The isothermal and kinetic parameters of lead (Pb) sorption by both the minerals and the modified-minerals were determined in a batch mode under various conditions such as different contact times and initial concentrations of Pb. It was found that the Freundlich model described well the isotherm experimental data of Pb sorption by the sorbents. Modification with chitosan, however, decreased the Pb adsorption capacity of sepiolite from 83 to 27 mg g-1 and that of bentonite from 56 to 29 mg g-1. Kinetic results showed that more than 24 hours was required for Pb sorption by the natural clays to reach equilibrium, while the equilibrium time reduced to 16 and 4 hours for Pb sorption on chitosan-sepiolite and chitosan–bentonite, respectively. The pseudo-second-order model well described the time-dependent Pb sorption data by sepiolite, chitosan-sepiolite, and chitosan-bentonite, suggesting that chemical sorption is the rate-limiting step of Pb adsorption mechanism. The Pb sorption data by bentonite showed the best fit with Elovich model. Eren, E. (2009). “Removal of lead ions by Unye (Turkey) bentonite in iron and magnesium oxide-ated forms.” J. of Hazardous Materials, 165, 63-70. He, Y.F., Zhang, L., Wang, R.M., Li, H.R., and Wang, Y. (2012). “Loess clay based copolymer for removing Pb(II) ions.” J. of Hazardous Materials, 227/228, 334-340. Niu, Y., Qu, R., Sun, C., Wang, C., Chen, H., Ji, C., Zhang, Y., Shao, X., and Bu, F. (2013). “Adsorption of Pb(II) from aqueous solution by silica-gel supported hyperbranched polyamidoamine dendrimers.” J. of Hazardous Materials, 244/245, 276-286. Ozcan, A.S., Gok, O., and Ozcan, A. (2009). “Adsorption of lead(II) ions onto 8-hydroxy quinoline-immobilized bentonite.” J. of Hazardous Materials, 161, 499-509. Ozdes, D., Gundogdu, A., Kemer, B., Duran, C., Senturk, H.B., and Soylak, M. (2009). “Removal of Pb(II) ions from aqueous solution by a waste mud from copper mine industry: Equilibrium, kinetic and thermodynamic study.” J. of Hazardous Materials, 166, 1480-1487. Gupta, N., Kushwaha, A.K., and Chattopadhyaya, M.C. (2012). “Adsorptive removal of Pb2+, Co2+ and Ni2+by hydroxyapatite/chitosan composite from aqueous solution.” J. of the Taiwan Institute of Chemical Engineers, 43, 125-131. Zhang, H., Tong, Z., Wei, T., and Tang, Y. (2012). “Sorption characteristics of Pb(II) on alkaline Ca-bentonite.” J. of Applied Clay Science, 65/66, 21-23. Liang, X., Xu, Y., Wang, L., Sun, Y., Lin, D., Sun, Y., Qin, X., and Wan, Q. (2013). “Sorption of Pb2+ on mercapto functionalized sepiolite,” J. of Chemosphere, 90, 548-555. 10. Fan, Q., Li, Z., Zhao, H., Jia, Z., Xu, J., and Wu, W. (2009). “Adsorption of Pb(II) on palygorskite from aqueous solution: Effects of pH, ionic strength and temperature.” J. of Applied Clay Science, 45, 111-116. 11. Hamidpour, M., Kalbasi, M., Afyuni, M., Shariatmadari, H., and Furrer, G. (2011). “Sorption of lead on Iranian bentonite and zeolite: Kinetics and isotherms.” J. of Environ. Earth. Sci., 62, 559-568. 12. Boudrahem, F., Soualah, A., and Aissani-Benissad, F. (2011). “Pb(II) and Cd(II) removal from aqueous solutions using activated carbon developed from coffee residue activated with phosphoric acid and zinc chloride.” J. of Chem. Eng. Data, 56, 1946-1955. 13. Yu, F., Wu, Y., Ma, J., and Zhang, C. (2013). “Adsorption of lead on multi-walled carbon nanotubes with di fferent outer diameters and oxygen contents: Kinetics, isotherms and thermodynamics.” J. of Environmental Sciences, 25(1), 195-203. 14. Wan Ngah, W.S., and Fatinathan, S. (2010). “Pb(II) biosorption using chitosan and chitosan derivatives beads: Equilibrium, ion exchange and mechanism studies.” J. of Environmental Sciences, 22(3), 338-346. 15. Wan Ngah, W.S., Teong, L.C., and Hanafiah, M.A.K.M. (2011). “Adsorption of dyes and heavy metal ions by chitosan composites: A review.” J. of Carbohydrate Polymers, 83, 1446-1456. 16. Wan, M.W., Kan, C.C., Rogel, B.D., and Dalida, M.L.P. (2010). “Adsorption of copper (II) and lead (II) ions from aqueous solution on chitosan-coated sand.” J. of Carbohydrate Polymers, 80, 891-899. 17. Fan, L., Luo, C., Sun, M., Li, X., and Qiu, H. (2013). “Highly selective adsorption of lead ions by water-dispersible magnetic chitosan/graphene oxide composites.” J. of Colloids and Surfaces B: Biointerfaces, 103, 523- 529. 18. Laus, R., Costa, T.G., Szpoganicz, B., and Favere, V.T. (2010). “Adsorption and desorption of Cu(II), Cd(II) and Pb(II) ions using chitosan crosslinked with epichlorohydrin-triphosphate as the adsorbent.” J. of Hazardous Materials, 183, 233-241. 19. Futalan, C.M., Kan, C.C., Dalida, M.L., Hsien, K.J., Pascua, C., and Wan, M.W. (2011). “Comparative and competitive adsorption of copper, lead, and nickel using chitosan immobilized on bentonite.” J. of Carbohydrate Polymers, 83, 528-536. 20. Wang, L., and Wang, A. (2008). “Adsorption behaviors of Congo red on the N, O-carboxymethyl-chitosan/montmorillonite nanocomposite.” J. of Chemical Engineering, 143, 43-50. 21. Humelnicu, D., Dinu, M.V., and Dragan, E.S. (2011). “Adsorption characteristics of UO22+ and Th4+ ions from simulated radioactive solutions onto chitosan/clinoptilolite sorbents.” J. of Hazardous Materials, 185, 447-455. 22. Chen, D., Li, W., Wu, Y., Zhu, Q., Lu, Z., and Du, G. (2013). “Preparation and characterization of chitosan/montmorillonite magnetic microspheres and its application for the removal of Cr (VI).” J. of Chemical Engineering, 221, 8-15. 23. Monvisade, P., and Siriphannon, P. (2009). “Chitosan intercalated montmorillonite: Preparation, characterization and cationic dye adsorption.” J. of Applied Clay Science,42, 427- 431. 24. Peng, Y., Chen, D., Ji, J., Kong, Y., Wan, H., and Yao, C. (2013). “Chitosan-modified palygorskite: Preparation, characterization and reactive dye removal.” J. of Applied Clay Science, 74, 81-86. 25. Gandhi, M.R., Kousalya, G.N., and Meenakshi, S. (2011). “Removal of copper(II) using chitin/chitosan nano-hydroxyapatite composite.” Int. J. of Biological Macromolecules, 48, 119-124. (Ch-Fe).” J. of Chemosphere, 82, 278-283. 27. Saravanan, D., Gomathi, T., and Sudha, P.N. (2013). “Sorption studies on heavy metal removal using chitin/bentonite biocomposite.” Int. J. of Biological Macromolecules, 53, 67-71. 28. Monier, M., Ayad, D.M., Wei, Y., and Sarhan, A.A. (2010). “Adsorption of Cu(II), Co(II), and Ni(II) ions by modified magnetic chitosan chelating resin.” J. of Hazardous Materials, 177, 962-970. 29. Zou, X., Pan, J., Ou, H., and Wang, X. (2011). “Adsorptive removal of Cr(III) and Fe(III) from aqueous solution by chitosan/attapulgite composites: Equilibrium, thermodynamics and kinetics.” J. of Chemical Engineering, 167, 112-121. 30. Wan Ngah, W.S., Teong, L.C., Toh, R.H., and Hanafiah, M.A.K.M. (2013). “Comparative study on adsorption and desorption of Cu(II) ions by three types of chitosan-zeolite composites.” J. of Chemical Engineering, 223, 231-238. 31. Wan Ngah, W.S., Teong, L.C., Toh, R.H., and Hanafiah, M.A.K.M. (2012). “Utilization of chitosan-zeolite composite in the removal of Cu(II) from aqueous solution: Adsorption, desorption and fixed bed column studies.” J. of Chemical Engineering, 209, 46-53. 32. Zhai, R., Zhang, B., Wan, Y., Li, C., Wang, J., and Liu, J. (2013). “Chitosan-halloysite hybrid-nanotubes: Horseradish peroxidase immobilization and applications in phenol removal.” J. of Chemical Engineering, 214, 304-309. 33. Gandhi, M.R., and Meenakshi, S. (2012). “Preparation and characterization of silica gel/chitosan composite for the removal of Cu(II) and Pb(II).” Int. J. of Biological Macromolecules, 50, 650-657. 34. Bidgoli, H., Zamani, A., and Taherzadeh, M.J. (2010). “Effect of carboxymethylation conditions on the water-binding capacity of chitosan-based superabsorbents.” J. of Carbohydrate Research, 345, 2683-2689. 35. Rhoads, J.W. (1986). “Cation exchange capacity.” Page, C.A. (Ed. ), Methods of soil analysis Part 2. ASA, Madison, WI, 149-158. 36. Sheikhhosseini, A., Shirvani, M., and Shariatmadari, H. (2013). “Competitive sorption of nickel, cadmium, zinc and copper on palygorskite and sepiolite silicate clay minerals.” J. of Geoderma, 192, 249-253. 37. Gunay, A., Arslankaya, E., and Tosun, I. (2007). “Lead removal from aqueous solution by natural and pretreated clinoptilolite: Adsorption equilibrium and kinetics.” J. of Hazardous Materials, 146, 362-371. 38. 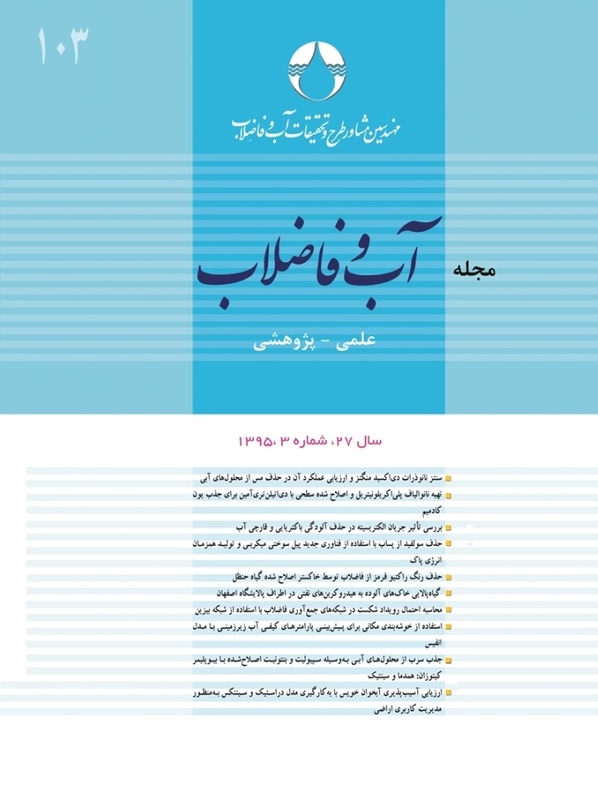 Bakhtiary, S., Shirvani, M., and Shariatmadari, H. (2013). “Characterization and 2,4-D adsorption of sepiolite nanofibers modified by N-cetylpyridinium cations.” J. of Microporous and Mesoporous Materials, 168, 30-36. 39. Randelovic, M., Purenovic, M., Zarubica, A., Purenovic, J., Matovic, B., and Momcilovic, M. (2012). “Synthesis of composite by application of mixed Fe, Mg (hydr)oxides coatings onto bentonite-A use for the removal of Pb(II) from water.” J. of Hazardous Materials, 199/200, 367-374. 40. Dalida, M.L.P., Mariano, A.F.V., Futalan, C.M., Kan, C.C., Tsai, W.C., and Wan, M.W. (2011). “Adsorptive removal of Cu(II) from aqueous solutions using non-crosslinked and crosslinked chitosan-coated bentonite beads.” J. of Desalination, 275, 154-159. 42. Jiang, M., Wang, Q., Jin, X., and Chen, Z. (2009). “Removal of Pb(II) from aqueous solution using modified and unmodified kaolinite clay.” J. of Hazardous Materials, 170, 332-339. 43. Ozdes, D., Duran, C., and Senturk, H.B. (2011). “Adsorptive removal of Cd(II) and Pb(II) ions from aqueous solutions by using Turkish illitic clay.” J. of Environmental Management,92, 3082-3090. 44. Zhang, A.C., Sun, L.S., Xiang, J., Hu, S., Fu, P., and Su, S. (2009). “Removal of ele-mental mercury from coal combustion flue gas by bentonite–chitosan and their modifier.” J. of Fuel Chemistry and Technology, 37, 489-495. 45. Deng, Y., Wang, L., Hu, X., Liu, B., Wei, Z., Yang, S., and Sun, C. (2012). “Highly efficient removal of tannic acid from aqueous solution by chitosan-coated attapulgite.” J. of Chemical Engineering, 181/182, 300-306.